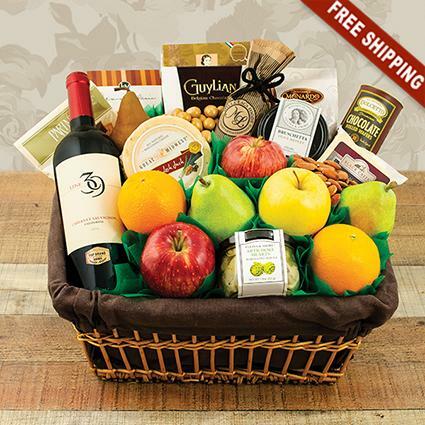 Go uptown with a luscious eight piece fresh fruit arrangement, California Cabernet and a host of gourmet delicacies! Line 39 Cabernet Sauvignon, from the 39th parallel running through the heart of California wine country, is an award-winning dynamic red wine. It exhibits expressive fruit flavors of currant, blackberry and ripe plum, with hints of dark chocolate. Enjoy with roasted and grilled meats.